Now, I've seen these before but none to ESL level or topic. 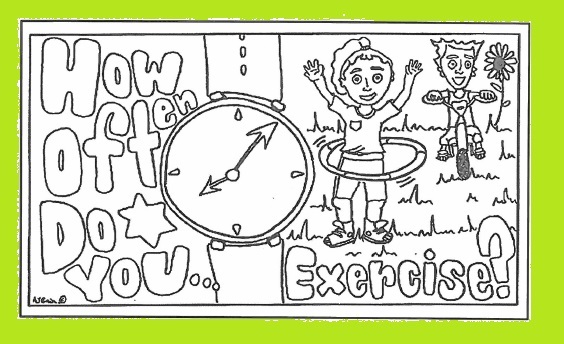 Basically it's just a little fun workbook to revise the How often do you exercise? lesson. 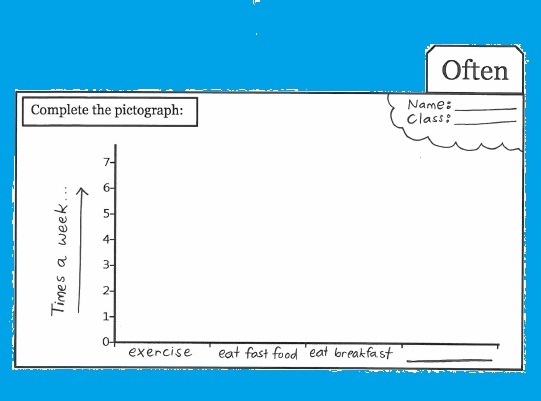 I'd advise that you do one page per lesson as a little closing activity OR you could keep it for a large project at the end of the lesson to review as well. It's also a good chance to miss a few of the boring activities in the textbook and just do one of the tab booklet pages instead. You can download my Tab Booklet here. The booklets , I tried to make them, as creative as possible while also practicing the key expressions and vocabulary. This is the title page (note, I added the coloured boarders) It's black and white for the kids to colour. Next, the first tab page. It's the first activity of the tab booklet. 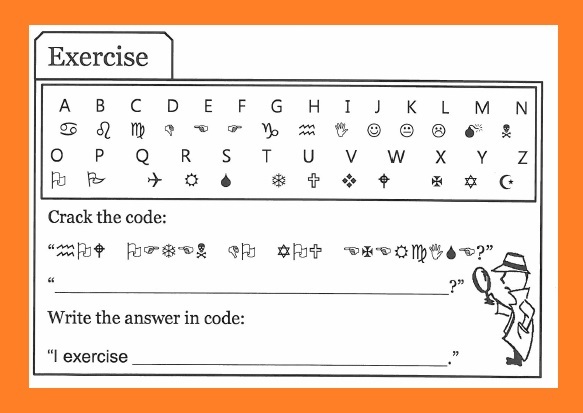 The students try to crack the code as well as write their own sentence using the code. 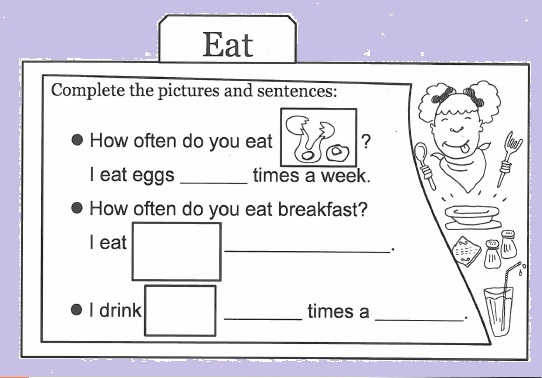 Here's the next page - here they complete the sentences with words as well as drawings. I've done the first one - a picture of eggs. 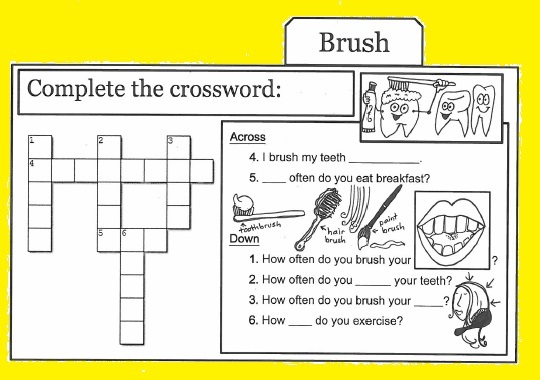 This is the third activity, a simple crossword to practice the brush your teeth/ hair phrases. And lastly, a simple pictograph to complete, about themselves. Or you could ask them to survey a friend. You will need to print and cut these booklets out, then staple at the end. 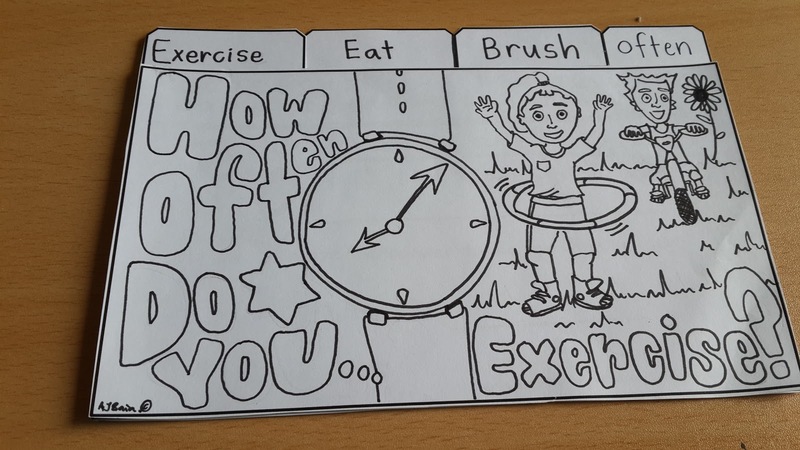 You could give them one tab page per class and the title page last to colour and staple all together - so that they get a sense of creating a project and a bit of a cool routine to break up the ordinary lesson . Or get them to cut and make the booklets for one lesson to review. I think these could be quite fun for the students, a nice way to spice up the lesson as it's getting more and more mundane as the year goes on - kids want something new. So here's a shot at something interesting, I hope! I'll be posting pictures of student work and let you know how it goes as soon as we get onto this lesson.